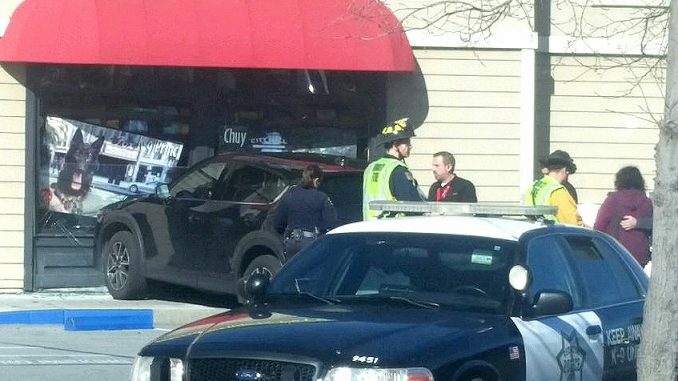 This car crashed through the window of Pet Food Express in Redwood City. Redwood City Fire Department photo. As if Mondays were not bad enough, employees at Pet Food Express at Sequoia Station in Redwood City had to clean up spilled pet food after someone drove through their side window. Just after 11:20 a.m. Monday (Jan. 21), the fire department got a call that someone had driven their car into the side wall and window of the pet food store, according to Battalion Chief Greg DaChunha. No one was injured. However, the car scattered some of the pet food at the store, an employee said. The food that is normally stocked along that wall has been moved to other places in the store until the building is repaired, the employee said. This happened a month or so at Blue Mercury. Why people keep driving into storefronts at Sequoia station?